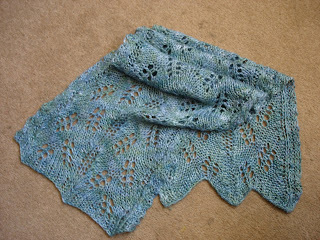 middlearthknitter: Its never too late to say thank you. Well, its all over. All that worry and fuss and rushing around like life depends on it. It all comes together into one perfect Christmas day with happy smiling faces, family, laughter and food that's just too good! We had a lovely slow paced relaxing Christmas here, the kids had a wonderful time and us big kids didn't have all that bad a time either. I was very lucky this year to receive some wonderful gifts from friends and family alike. Our family try very hard to get something that will either be useful or will be cherished and loved and this year I think they outdid themselves! Mum got us a fantastic picture of the four of us printed onto a large canvas. It now has pride of place on the once bare wall of our living room, I cant help but smile when I look at it, as I take the majority of pictures in the household its a very rare thing t have a nice family shot. This one was taken the day of mums wedding and is a lovely natural shot of us. Thank you so much mum and co! Dad and his wife gave me a very special necklace with two hearts on it, its so pretty and its been such a long time since I had a special and pretty piece of jewelry, I haven't taken it off since I put it on Christmas day, I love it and it will be cherished! 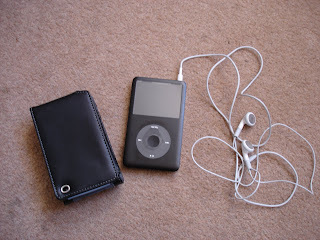 The lovely better half of me bought me an Ipod classic, which is an amazing piece of kit, I don't think I can ever fill it, the capacity on it is just crazy huge, i can play music AND dvds on it, I love it and it goes everywhere with me now. Don't think I am forgetting piccies, I thought I would save that bit for last ;) here they all are in all their glory! Kate's Glorious sockies, they fit like a dream, she has some sort of voodoo sense to get them to fit so perfectly without seeing my feet! 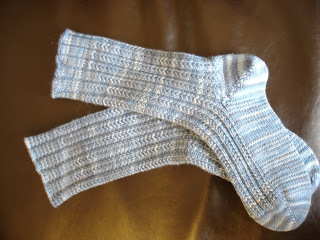 Diane's amazing soft snugly socks, these are my official sit n knit with feet up socks! 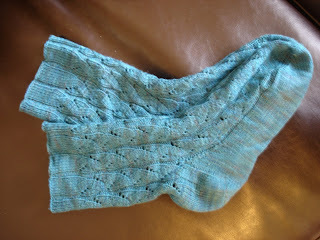 Kai's neck warmer, this is so pretty it will be saved for those occasions when I am going somewhere nice with the Mr.
My super fab Ipod classic. Here's to a great new year ahead of us all folks! Happy new year! Lovely socks and pressies you got! Ooh, look at the pretties. Mmmm.